Among the aguas frescas served throughout Latin America, horchata (or-CHAH-tah) tops the list of favorites in Mexico. The refreshing chilled beverage combines water and/or milk with fruit, seeds, nuts, or grains (such as sesame or cantaloupe seeds, almonds, walnuts, or white rice and cinnamon). You can buy bottled syrups to make horchata, but this version makes it easy to prepare homemade horchata from scratch. Pulverize the rice in a blender until it reaches a floury consistency. Toss it with the cinnamon stick and lime zest, and let it rest in an airtight container at room temperature overnight. Put the rice mixture back in the blender and blend it until the cinnamon stick pieces get fully broken down. Add 2 cups of water to the mixture and stir it. Put it in the refrigerator to soak for 2 hours. Strain the liquid into a pitcher or bowl through a fine sieve or a few layers of cheesecloth, squeezing frequently to remove as much of the milky rice water as possible. Add the remaining 3 cups of water and the sugar; stir until the sugar dissolves. Refrigerate the horchata until completely chilled. Serve it over ice, if desired. Coffee Horchata: Follow the basic recipe, adding 1 to 2 teaspoons of instant coffee powder with the sugar in step 4. Coconut Horchata: In step 4, replace 1 cup of water with 1 cup of coconut milk (not coconut cream). Strawberry Horchata: Add 2/3 cup of fresh or frozen strawberries to the mixture after step 3; blend until smooth. 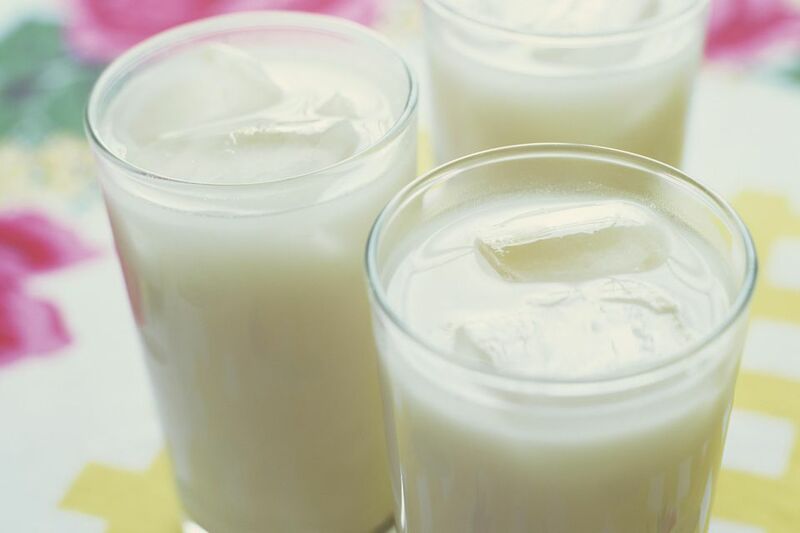 Vanilla Horchata: Add 1/4 teaspoon of vanilla essence to each glass of horchata right before serving. Chocolate Horchata: Add 1 to 2 tablespoons of cocoa powder to the mixture after step 3; blend or stir vigorously until smooth. Nut Horchata: Add 1/3 cup chopped pecans or walnuts to the mixture after step 3; blend until smooth.